WINCH ULTRA MOUNT 32ft 3PC SET. QUICK DISCONNECT TRAILER MOUNTED WINCH WIRING KIT. THESE KITS ARE MADE USING, FLEXIBLE, High Power DCCA COPPER (the best for this power and in these lengths) 2 GAUGE HIGH STRAND ULTRA FLEX CABLE WITH A HIGH QUALITY OIL / FUEL RESISTANT ULTRA FLEX COATING. THE LUGS USED ARE HYDRAULIC CRIMPED, COVERED WITH SCORPION HIGH GRIP ADHESIVE LINED HEAT SHRINK (PROVIDES AN ULTRA LONG LASING SEAL). HIGH POWER CONNECTORS, KEYED QUICK DISCONNECT CONNECTORS , THE BEST IN THE INDUSTRY. Use this on your Dump trailer for Fantastic service, Did you ever go to use your dump trailer and the battery is dead, Ugh... 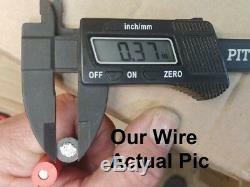 Please see our other auctions for a High Amp Circuit Kit commonly used on this kit, Or any 12v high power install, Our kit includes the High Amp 12v Breaker (resetable), a 4ft section of High Amp connector wire, 3/8 lug ends pre-installed for convenience. We can substitute Anderson Gray in place of Anderson Red, Just ask at checkout. Red fits Red and Gray fits Gray. Please see our other auctions if you need the Anderson Yellow for Champion winches. 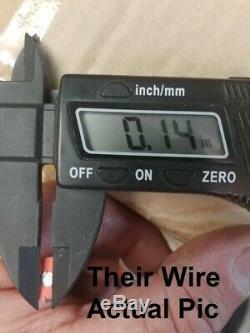 Enough to reach the back of your truck and use your winch or other high power items. Use the supplied Parrot Clamps to operate your winch or other High Power item using a battery direct. 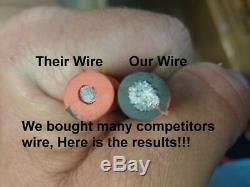 THIS CABLE IS GOOD FOR ALL WINCHES, I USE THIS ON MY WARN 16500 WINCH AND IT PERFORMS FLAWLESS!! Designed for winches up to 18,000lbs, Dump Trailers to the same capacity. INCLUDED IN THIS 32FT KIT ARE THE FOLLOWING 3 ITEMS. 1 - 24 FT 2 GAUGE TRUCK SIDE QUICK DISCONNECT CABLE, INCLUDING SOLID CONTACT END LUGS WITH 3/8 HOLE, ALSO INCLUDED RUBBER DUST COVER (RED TO BATTERY POSITIVE, BLACK TO BATTERY NEGATIVE). 1 - 6 FT 2 GAUGE WINCH SIDE QUICK DISCONNECT CABLE, INCLUDING HIGH CONTACT END LUGS WITH 3/8 HOLE, A RUBBER DUST COVER IS ALSO INCLUDED ON THIS END (RED TO WINCH POSITIVE, BLACK TO WINCH NEGATIVE) 1 - 20 IN HIGH AMP, EXTREME GRAB PARROT CLAMPS ALLOWING THIS SET TO BE USED AS A JUMPER CABLE SET AS WELL, WHY LIMIT YOUR OPTIONS? WE CAN MAKE THIS TO YOUR EXACT SPECS WITHIN THE 32FT AT NO ADDITIONAL COST, EXAMPLE: 15FT VEHICLE SIDE 12FT WINCH SIDE AND 5FT JUMPER SIDE TOTAL 32FT. YOU CAN PAY MORE ELSEWHERE, FOR LESS, BUT.. Create listings that get noticed! With Auctiva's 1,800+ Templates. The item "2-GAUGE-32-FT Hi-amp UNIVERSAL-QUICK-CONNECT-WIRING-KIT-TRAILER-MOUNTED-WINCH" is in sale since Saturday, March 11, 2017. This item is in the category "eBay Motors\Parts & Accessories\Car & Truck Parts\Exterior\Towing & Hauling". The seller is "audiohighway" and is located in North Collins, New York. This item can be shipped to United States.